We’re frequently told to recycle more these days and not to let those old discarded objects and household items go to waste. In fact, this very magazine used to share an office with a title that preached the value of ‘upcycling’ – that is, to give something that was once used for a specific purpose a second life, fulfilling a different purpose. You could say that Finland’s Cleaning Women were exponents of this philosophy well before it became a popular concept. 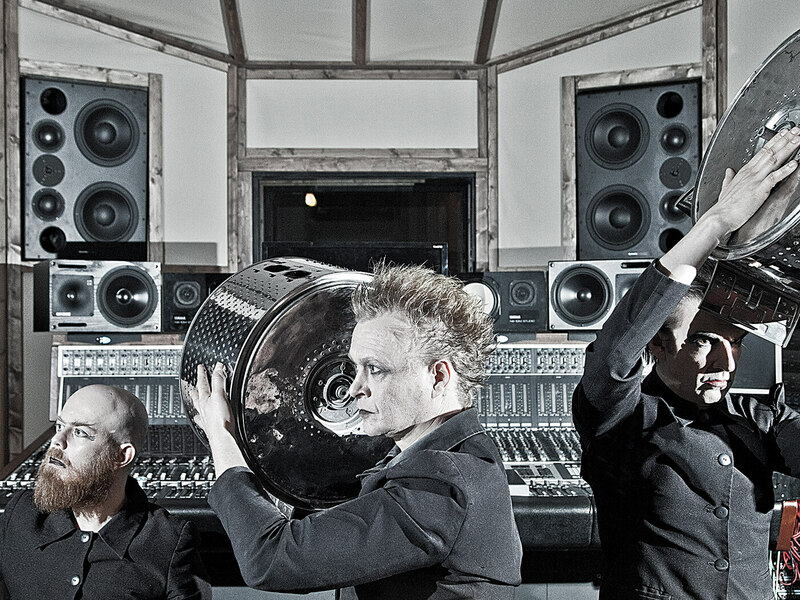 Originally formed back in 1996, the band utilise electronically reinforced household utensils such as laundry racks, washing-machine trolley wheels and coffee-bean tubs to create their work, turning them from junk into incredibly characterful and sonically versatile instruments. 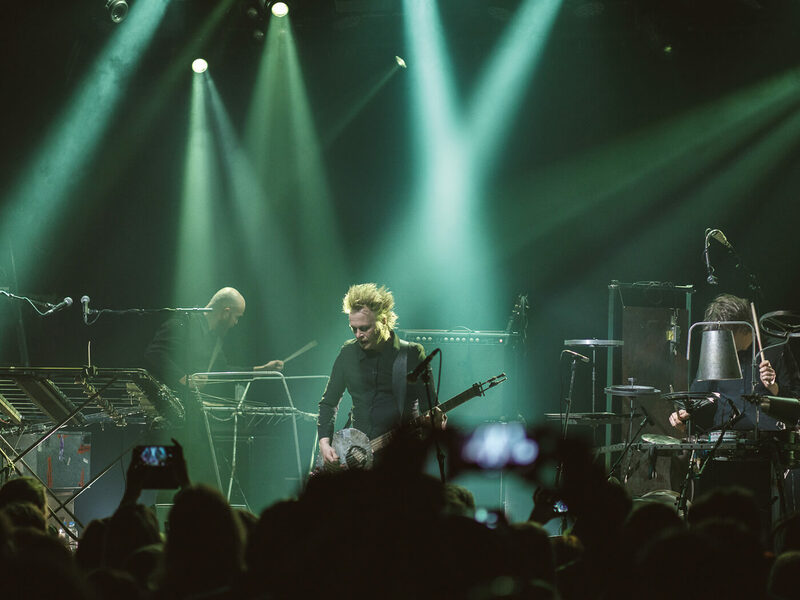 Aside from their individual approach to music-making, the band’s visual aesthetic is notable, too – they perform in black jackets, boots and tights. 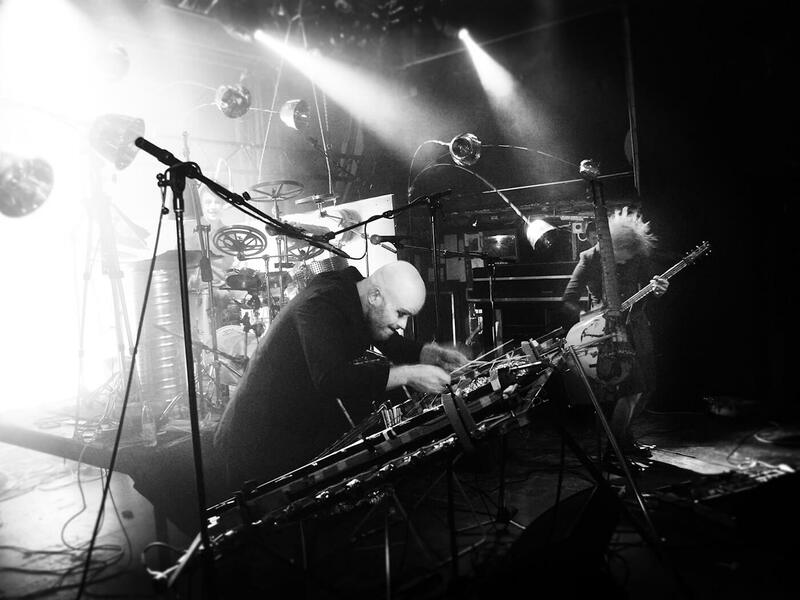 It’s no surprise that the band are heavily influenced by the avant garde and are currently working on audio-visual art installations as well as recording music. How did your band Cleaning Women first get established? Tero Vänttinen: Well, it was by accident, really. There are three of us in the band and Risto (who is also known as CW01) was drying his laundry in his student apartment and was in the middle of some experiments with contact mics and effects pedals. So he had this habit of trying contact mics on all kinds of different things around this point in time. He was hanging his clothes to dry on a laundry rack and accidentally tapped it and it made a nice metallic sound that vibrated for a long time. Then he started to experiment with a contact mic and that then also became something quite interesting. A short while later, a friend of his had a party, during which they put on a performance with two of these laundry racks as well as some visuals. During that performance, they were asked what they were called, and they quickly settled on Cleaning Women as their name. So were you guys all making music conventionally before? Myself and the drummer Timo (CW03 in the band) make music together separately from the band, but it’s kind of an accident that all three of us came together for Cleaning Women. When the project first started, we didn’t really have any musical references or anything like that, so it just started with the idea of experimenting with sound and with household items. Then we moved on to building self-made instruments that are usually somehow related to household items or recycled things – like things found in the trash – and that became our niche. So are you always on the lookout for new instruments? Yes, and that’s also the reason we built our instruments. Initially, there were just two laundry racks, which is quite limiting in terms of the types of sounds you can create. So, little by little, there has been an evolution of new instruments. We experimented at first with the laundry racks and attached some bass-guitar strings to one of them, so we had a rudimentary bass element to our tracks, but then we realised we had to create some different types of instrument. Getting a decent bass instrument, which enabled us to write bass riffs and generate bass sounds, was important. When I joined the band around 20 years ago, we built one that had a body built from clothes-hanger rods, then there were some tuning pegs attached to it and strings. It works just like a normal electric bass. Do you have your assigned instruments or do you mix and match what you play? Yeah, we basically have our own set of instruments and responsibilities in the band. There’s one instrument that we call the ‘melodic kling klang’, which is made out of piano wires and has a very melodic sound. It’s now attached to the drum kit and Timo will occasionally play it, but I’ll also play that too sometimes, particularly during our silent-film performances. But usually we have our own instruments. It’s basically like this: there is a drummer (Timo), there is a guitarist and stringed-instrument player (Risto) as well as a bassist who dabbles in percussion (which is what I do) and I also sing. It’s not all that traditional, really, but the division of labour is similar to a normal three-piece band. How do compositions and songs begin with these instruments? We get together and usually we just start to play – sometimes, some of us have some ideas, perhaps it’s a melodic idea or a riff of some sort. All of us play a part with composing and we’ll all come up with new ideas as we go. At some point, it twists into a composition that you can play in front of an audience. Also, we have made quite a lot of music for silent films, which has a very different approach. You can’t be so ‘straight’ – the music has to be more subtle. But we also then take the material that we have made for silent films and sometimes make those themes into separate compositions that we play in our live gigs and put on our records. We mix everything up and sometimes steal from ourselves. How difficult is it to perform live with these instruments? Are they all amplified? For some instruments we have amps, but for some we have the option to go directly into the PA. In the early days, we only had line signals going to direct inboxes and our sound was quite dry. You can hear this in our first record, Pulsator. I don’t think we even used amplifiers when we were recording that album. It sounded really dry and there’s like an artificial echo put in the mix after the fact. But now, our drum kit, for example, sounds pretty good acoustically. In our live set, we mic the kit exactly like a normal kit. We emphasised this on the new album, as our instruments have been developing to the point where it all sounds naturally good and we can actually just record them acoustically. We wanted to go into a really good studio with a really good room sound and then play there and record our natural acoustic sound. How long have you been working on your latest record, Intersubjectivity? The previous album came 10 years ago, so it’s been quite a while but, of course, we have been doing lots of other things. Actually, before we went in the studio, for like one month we just practised our new material relentlessly. We wanted to go in the studio and record the album quite quickly with minimal overdubs, so that’s why we had to practise. During that practising period though, we found ourselves coming up with a lot of new material, so we ended up junking a lot of stuff that we thought would be on this album and replacing it with the new stuff. I think our newer stuff is much more melodic and has more vocals. It’s kind of more pop, or at least our version of that genre. In the studio, did you use conventional recording tech? At E-Studio, where we recorded Intersubjectivity, they have really great gear. They have this physical plate reverb there which we used heavily. We have this electric coffee-bean can bouzouki, which is like a guitar, and we just recorded the output from the amplifier and only added the plate reverb to it. That’s the only effect we used on the signal. We try to keep those natural sounds as untouched as possible, but we do love good-sounding reverbs. Just five days, and actually we managed to record the vocals within that time, too, but then we made a few overdubs – perhaps a few extra vocals and a bit more percussion on certain tracks. It was only minor stuff, but basically, everything was recorded at the studio in those five days. What tracks on the new record are you most proud of and why? All of them work well together. We wanted to make quite a tight album, so there are only 10 songs. We left out some songs because we thought they didn’t quite flow with the rest of the material. I guess the first five tracks are pretty strong. There’s one song that is sung in French which was a nice experience for me, as I was trying to learn some French, and then when we were rehearsing we came up with something that had quite a French feel to it. I went home and I looked through a phrase book and managed to find some really good-sounding phrases that, when put together, had a very nice poetic quality. I really can’t speak French, though! Do you ever find time to collaborate with other musicians? Very rarely, I have to say, but we have done some collaborations. 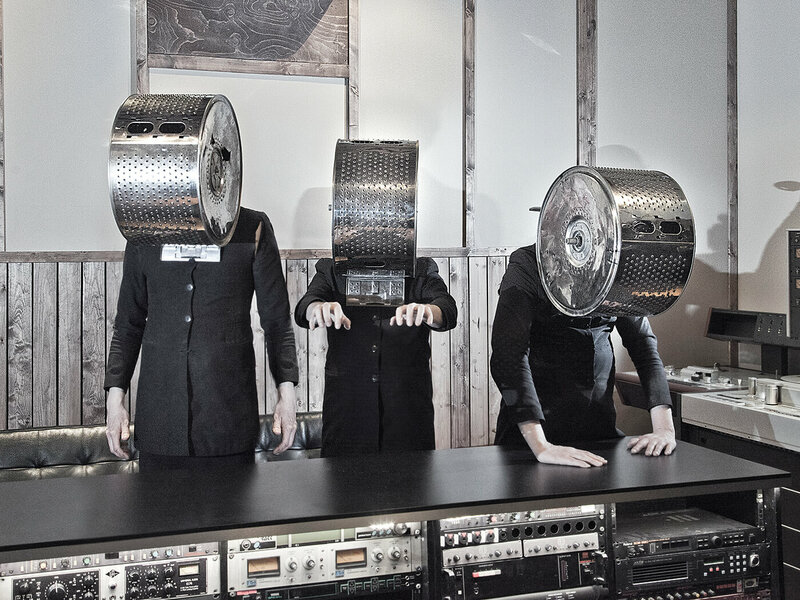 On our first album, we worked with legendary Finnish underground and avant garde musician M.A. Numminen. He used to be quite notorious in Finland for his controversial, provocative work in both music and film, and everyone knows him now. So that was fun. On the second album we collaborated with the Russian musician Yevgeni Fedorov, but not many other people since. If someone was looking to create their own instruments, what’s your number-one piece of advice? Well, first of all, everything makes a sound, that’s the first thing to say. Try experimenting with everything. Also contact mics are useful to get hold of. They are basically microphones that pick up vibrations from contact with objects, compared to the standard type of microphone which picks up pressure waves in the air. If you put that onto anything and you amplify it, then you usually find interesting new sounds. Everything has the potential to be an instrument, at least in a percussive sense. If you need to make it melodic, then it gets pretty challenging. What we have found out is that the evolution that the human race has gone through means that creating instruments dictates what we can do. There are many objects that you can hit that have rhythmic potential, but then we have the need to get some melodies, and then we have to think about how we do that. The laundry rack, for example: it has those long thin rails where you put your clothes. They go all the way to the other side and we realised that if we cut them, then we can have different pitches, so the longer each is, the lower the sound. Then melodic ideas emerge from an instrument that was just percussive at first. There are always new things to be discovered, but at some point, you realise that the laws of physics restrict you from doing too much with each instrument. We’re concentrating on our tour, which is coming up soon and just trying to organise some gigs outside of Finland. Outside of that, we’ve just had an art exhibition in Helsinki which was our first art exhibition using our Cleaning Women name. We have made audio-visual installations with our instruments and it was pretty different. It was more visual, though, and that’s something we want to pursue further. To find out more info about Cleaning Women, check out their official website here.